I have been shopping a lot, too much if you ask me, but it hasn't been for me at all. It has been mostly for the home I have been decorating. It is coming along and I hope to have it wrapped up soon and I will be sure to share. While, hubby was away I did get to do a bit of yard saling. My intention was to find a few lovely deals for the home I am decorating, which I did find an old trunk that I am going to attach casters to and make a coffee table. 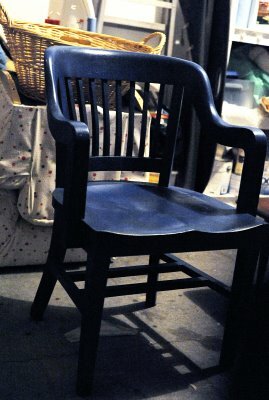 I also happened to find a wonderful old wooden chair that needs just a bit of painting. I really have no where to put it, but I fell in love, it reminds me of an old chair that my grandfather once owned. It cost me a whooping $5.00.